It’s the little things in life that direct our path. When we may boast of the great things or the big things that we have done or tried to do, it’s the small things that give us our direction. Read James 3:2-5. If we’re looking at actual physical size, the tongue is one of the smallest members of the body. Our hands, our feet, our legs all are larger in size than our tongue, yet our tongue dictates the path that we travel down in life. How we speak to one another, what we say, and the manner in which we say it all has direct impact on the legacy that we leave around us and the perception that others have above. What do people hear from us? 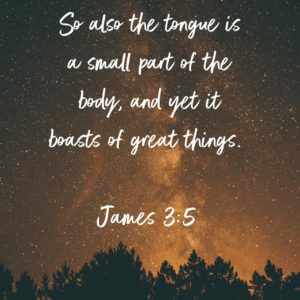 Do we speak words of encouragement and life-giving peace to others? Do our words reflect our relationship with Jesus Christ? James just finished talking about how our faith must be lived out in our actions everyday. It’s no coincidence that he goes from that straight into the impact our words make on our life. Our words are our actions and just like our faith, our words must line up and demonstrate the faith that we have through the words that we say. Are our words a reflection of the action that we are taking because of our faith in Jesus Christ?